The solution? Reduce the amount of time that the monument is in the spotlight. The change resulted in immediate results: 90 percent of the insects disappeared, the excessive cleaning was no longer needed, and the memorial’s electric bill plummeted. The irony, of course, is that Jefferson’s name is synonymous with light. Lots of light. Known as the Father of American Democracy, Jefferson was a proponent of individual rights and advocated a strong local government. He believed citizens have a civic duty to aid the state and resist corruption. In other words, he believed government — and democracy in general — works best when there is ample light shining in on all its workings. March 10-16, known as Sunshine Week, celebrates that light. It also pays tribute to Jefferson’s belief in civic virtue and his fight for the right for all citizens to be informed and have a say in their government. 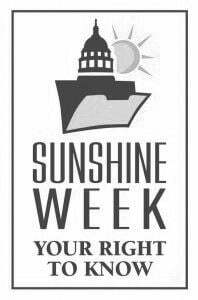 While Sunshine Week lasts only seven days, it’s up to all of us to keep the sun shining on government all year long. In Minnesota, the Open Meeting Law and the Government Data Practices Act are two strong tools that defend our right to know how and why government makes decisions on our behalf. I believe most people working in government, including those serving in elected office, have our best interests at heart. But sometimes motives — unintended or otherwise — can sway our leaders to make decisions in the dark. During my tenures as editor of two community newspapers, I witnessed numerous acts that circumvented the spirit — if not the letter — of the Open Meeting Law and Government Data Practices Act. I saw public bodies conduct meetings at 7 a.m., a time that’s inconvenient for many members of the public. I saw public bodies conduct business in conference rooms so small that there was no space, sometimes not even a chair, for citizens to view the proceedings. I witnessed “emergency meetings” called with only a few hours’ notice because one of the members was about to leave town. According to the law, an emergency meeting can only be called without the mandatory 72-hour advance notice when there is an actual emergency, such as a tornado, fire or flood. During my 40-plus years in journalism, I recall only one emergency that met that test. I learned about a local public body conducting a workshop almost an hour’s drive out of town. The law requires bodies to deliberate within the borders of their community. On more than one occasion, I saw a board elect its executive officers with no discussion — as if the slate had been discussed privately and decided before the meeting. I once was told by a government administrator that he had instructed his public board to conduct a straw vote on an issue, a blatant violation of the Open Meeting Law. In another instance, a clerk asked one of our paper’s reporters why he was requesting a list of government workers’ salaries. Governments are required to hand over that information without regard for how it might be used. These instances are exceptions. As I said before, I believe government operates in the light most of the time. It’s when it doesn’t that democracy suffers. A community newspaper is one of government’s watchdogs. A good watchdog will try to stop an intrusion before it occurs. During my time in Hutchinson, I was fortunate to work with a city attorney who respected and honored the Open Meeting Law. Every two years, we collaborated on hosting an informational session on the law for area residents who were newly elected to the city, county, school board and area town boards. It was a partnership that produced dividends year round. Over time, violations of the Open Meeting Law and Data Practices Act seemed to decrease. Honesty requires light. Let’s work to keep the light shining on government at all times. It’s good for democracy. Few good things result from darkness — unless you are trying to lower maintenance costs at the Jefferson Memorial. Doug Hanneman is retired from newspapers. He served as editor of the South Washington County Bulletin and the Hutchinson Leader.